On their most recent trip to Peru, Crimson Cup Education and Sustainability Director Brandon Bir and Coffee Buyer Dave Eldridge worked to expand relationships with local coffee growers, baristas and cafe owners while spreading knowledge of American coffee quality standards. In just six years, I’ve seen significant advances in coffee quality – in farming, processing, roasting and café culture. Especially since Cup of Excellence came to Peru, more people are involved and motivated to continue learning and perfecting their craft. Columbus, Ohio coffee roaster Crimson Cup Coffee & Tea is working with Peruvian coffee farmers, café owners and baristas to improve the quality of coffee they grow and prepare. Recently, Education and Sustainability Director Brandon Bir and Coffee Buyer Dave Eldridge led a team including executives from The Ohio State University to expand relationships and spread knowledge of American coffee quality standards. Bir and Eldridge were accompanied on the trip by Senior Director Zia Ahmed and Corporate Executive Chef Lesa Holford of the Ohio State University, Office of Student Life, University Dining Services. The university serves Crimson Cup coffee on campus. The team spent the first three days of the trip exploring café culture in the Miraflores and Barranco suburbs of Lima. 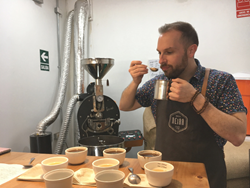 While there, Bir – who is an SCA certified coffee taster and licensed Q Grader – helped Peruvian Barista Champion Mauricio Rodriguez of Neira Café Lab prepare for the World Barista Championship in Amsterdam. From Lima, the group flew to the mining town of Tarma, and then drove through the Andes to reach NARSA (NEGOCIACIONES AGROINDUSTRIAL AREVALO S. A.) a cooperative based in La Merced, capital of the Chanchamayo Province in Peru’s Junín Region. Since 1988, NARSA has focused on helping small coffee and cacao farmers in Peru’s Central Highlands and Amazon regions with achieving market access throughout Peru and beyond. Through its Friend2Farmer direct trade program, Crimson Cup has been working with NARSA Founder Don Julio Arevalo Tello for the past six years on quality initiatives such as raised drying beds and cupping competitions among local farmers. Currently, Crimson Cup is helping NARSA develop a coffee quality lab built to the new Specialty Coffee Association standards that went into effect in January 2018. Bir, who is an SCA certified lab inspector, went over progress with Denise Carrión, commercial manager for NARSA. Bir plans to return to NARSA in August to inspect the completed facility for potential SCA certification. Once certified, the lab will become an important resource for coffee education in the region. The group also visited Cholo Café founded by Arevalo’s daughters, who are both Cordon-Bleu trained chefs. The café serves local coffee and dishes inspired by local farms and ingredients.